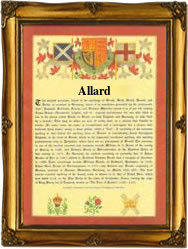 This interesting surname, with variant spellings Allard and Adlard, may be either of (Norman) English or French origin, and derives from the Anglo-Norman French male given name "Alard", itself coming from the Old French "Adelard", a compound of the Germanic elements "adal", noble, and "hard", hardy, brave, strong. Alard (above) is believed to have absorbed the Olde English names "Aelfheard" and "Aethelheard" meaning respectively "elf-brave", and "noble-brave", and the Domesday Book (1086) names "Ailardus" and "Aelard" may derive from either source. The Pipe Rolls of London, dated 1198, mention Alard the Fleming, and in 1212 Rogerus filius (son of) Alardi or Adelard was recorded in the Feet of Fines for Lincolnshire. Early examples of the surname include: Richard Alard (Gloucestershire, 1209); Nicholas Adelard (Worcestershire, 1275); and John Allard (Sussex, 1332). A Coat of Arms granted to the Allard family is a silver shield with three red bars, on an azure canton a gold leopard's face. The Canton stands very high among honourable bearings, and symbolises reward for the performance of eminent service. The first recorded spelling of the family name is shown to be that of Roger Aillard, which was dated 1205, in the "Pipe Rolls of Gloucestershire", during the reign of King John, known as "Lackland", 1199 - 1216. Surnames became necessary when governments introduced personal taxation. In England this was known as Poll Tax. Throughout the centuries, surnames in every country have continued to "develop" often leading to astonishing variants of the original spelling.